Off-budget is the revenue and spending of certain federal entities that Congress wants to protect from the normal budget process. Off-budget spending is excluded from budget caps, sequestration, and pay-as-you-go requirements. The federal unified budget includes both off-budget and on-budget revenue and spending. It's the budget used to report each year's budget deficit. But the U.S. debt.increases by the deficit of on-budget items only. The two federal entities that are off-budget are the Social Security Trust Fund and the U.S. Postal Service. There are some other federal entities that perhaps should be included as off-budget expenditures. The Social Security Trust Fund consists of two funds, the Old-Age and Survivors Insurance, and the Disability Insurance Trust Funds. These funds invest the proceeds from payroll taxes that provide income for Social Security benefits. In 1983, these funds began accumulating large surpluses. There were many more workers paying into the funds than retirees taking out benefits. Until 2010, the taxes more than covered expenses. Congress requires the U.S. Treasury to invest the payroll tax income in "securities guaranteed as to both principal and interest by the federal government." The Treasury issues these special interest securities as it does U.S. Treasury bonds. There are three differences. They are not tradeable, they are only available to the trust funds, and they are only bought with payroll taxes. After creating the bonds, Treasury sends the payroll taxes into the General Fund. They are not supposed to be used to finance tax cuts or spending increases. 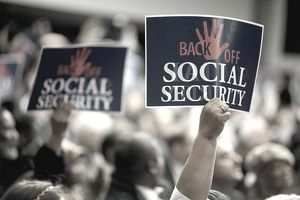 Otherwise, there would be none left to fund Social Security benefits when retirees need it. When the Treasury needs to pay Social Security benefits, it uses General Funds to redeem the bonds, with interest. But calling the revenue off-budget didn't really protect it. Instead, Congress worked with two budgets. It planned its spending using the unified budget, which included the off-budget revenue from Social Security revenue. In this way, it "borrowed" Social Security Trust Funds when planning spending. The borrowed funds made federal budget deficits look smaller. The real amount owed still shows up in the debt. It explains why the U.S. debt by the president is larger than the U.S. deficit by president. The United States Postal Service became another quasi-government entity in 1970. It tries to compete with super-competitive FedEx, UPS, and Amazon to meet your shipping needs. But Congress requires it to be revenue neutral. It is supposed to fund all its operations from its revenue, like a business. For this reason, President Nixon moved it off-budget in 1974. But Congress uses the unified budget to set policy for the USPS. It requires the agency to fully fund the pension for its workers. It must also pay for any military service by its employees. The funds that are set aside are off-budget. But, like Social Security Trust Funds, they are included in the unified budget. It's another reason why the deficit is smaller than the addition to the debt. For example at how the off-budget total is recorded, take a look at the FY 2016 budget. The widely-reported deficit was $585 billion. But the addition to the debt was $1.423 trillion. Other examples appear when you compare deficit by year to debt by year. These are different that quasi-governmental entities that aren't even included in the unified budget. These three entities are Fannie Mae, Freddie Mac, and the Federal Reserve. Fannie and Freddie were bailed out by the U.S. Treasury Department in 2008. It took over the quasi-governmental agencies to prevent their bankruptcy. Since they guaranteed 90 percent of all U.S. mortgages, their collapse would have disrupted the entire U.S. housing industry. Before 2008, Fannie and Freddie were government-sponsored agencies. They operated like a business and were expected to be profitable. But all their products were mortgage-backed securities. These were guaranteed by the government. This disastrous hybrid led to their destruction. They took risks to increase their profit, knowing the government would bail them out. They are both government agencies now but remain off-budget because the take-over was supposed to be temporary. The Federal Reserve performs a government function by managing monetary policy. It sets interest rates and controls the money supply. But it is independent of Congress and political influences. It funds itself from earnings on its lending to member banks and its investments. It sends it profit to the U.S. Treasury each year, which is recorded as revenue in the budget.